Moving from early professional life to a mid-career phase comes with vast changes. One realizes that roles aren’t always set in stone, and much depends on carving your own role and path ahead. Often, responsibilities shift from areas of core technical expertise to broader areas such as strategy, management and revenue. One is no longer expected to ‘perform tasks’, but to ‘set’, ‘lead’ and ‘drive’. At this stage, professionals can feel ill-equipped or sometimes just unsure. Furthering one’s education can bridge this gap, providing the skills and the cross-functional knowledge needed to step up. Participating in a residential management program means taking a sabbatical – a challenging proposition at this stage of the career. Additionally, there’s a very real opportunity cost of forgoing your income for the period while paying for the education. For self-employed professionals and entrepreneurs, it may be altogether impossible to halt business or move cities. 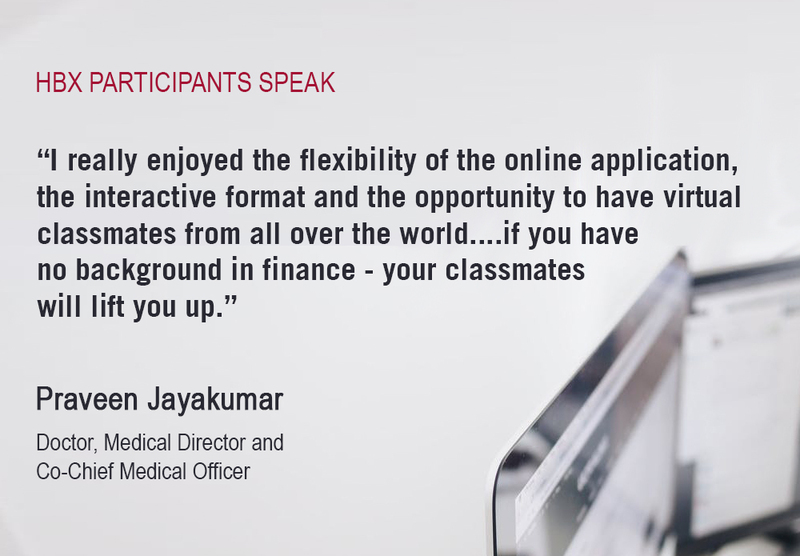 HBX, the online learning initiative of Harvard Business School (HBS), provides business education to meet exactly these needs, while solving for the constraints of location and time. A variety of self-paced management courses, built on the tenets of the innovative HBS classroom pedagogy, offer an immersive and challenging learning experience through its interactive online learning platform. What makes it fun and effective is that the platform provides opportunities for, and organically supports, peer learning and knowledge-sharing across a global network. For mid-level professionals, who have typically spent 5-10 years in a specific industry and developed skills in a core discipline, the next level of growth demands familiarity with many other aspects of business – strategy, operations, negotiation, and finance to name some. Individual contributors need to develop a more generalist approach to make better business decisions. For example, when a mid-level doctor or healthcare professional working for a hospital transitions to a senior or leadership role in hospital management, she needs to be able to make decisions, weighing multiple aspects, for several functions of the organization. This requires skills such as interpreting data, studying the market landscape and developing differentiated offerings, understanding the financial implications of operational decisions and analyzing pricing and consumer behavior. If she is comfortable with business concepts and armed with the right tools, she can drive better operational performance and profitability, as well as enhance patient experience at the hospital. This ultimately leads to achieving both individual and business growth. This extends across industries. For example, an IT professional working for a tech company could help his organization develop innovative ideas and diversify revenue sources by developing a more holistic view of the business and its services. HBX facilitates a holistic understanding of business through courses that are designed for real-world problem-solving, active and social learning. These courses are delivered through an online platform that leverages the HBS ‘case-based pedagogy’. Students watch short, highly produced videos with professors and industry experts, and utilize innovative interactive tools to deepen their learning of the course concepts. 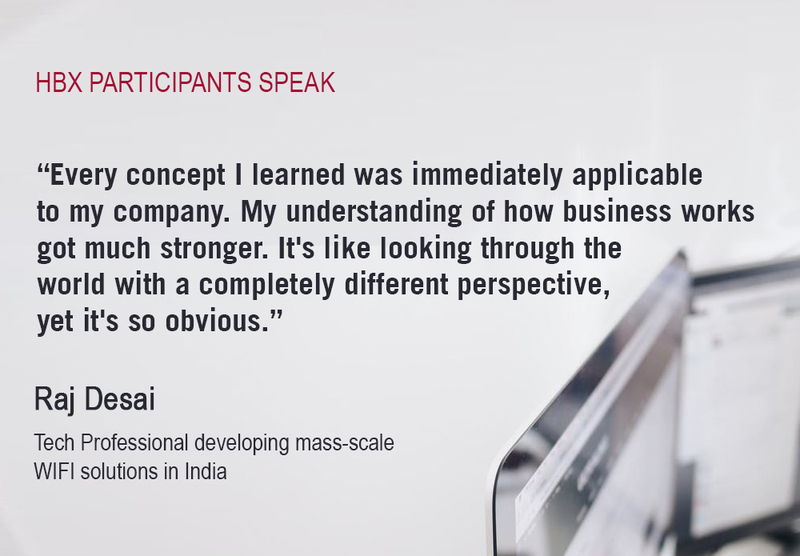 Instead of starting with theory, HBX participants start by grappling with a business problem – with real world data and the complexity in which a business leader would have to make a decision – and learn the theory inductively. Working professionals find it instantly relatable and easier to apply learnings to their immediate contexts. Questions, based on case studies, can be in the form of either a poll or reflections. Everyone’s answers are then visible to the ‘classroom’. In the words of Professor Bharat Anand, Faculty Chair, HBX, “This turns out to be a really important distinction. The answers are being updated in real-time. You can see the distribution of answers, but you can also see what any other individual has answered, which means that you’re not anonymous.” Students have real profiles and get to know their ‘classmates’ and learn from each other. The social learning aspect brings forth perspectives and insights from other participants with diverse backgrounds who are working in different markets and industries. For professionals, this is a significant difference from learning on the job. They imbibe learnings from contexts different from theirs and are exposed to things that they may not discover on their own. 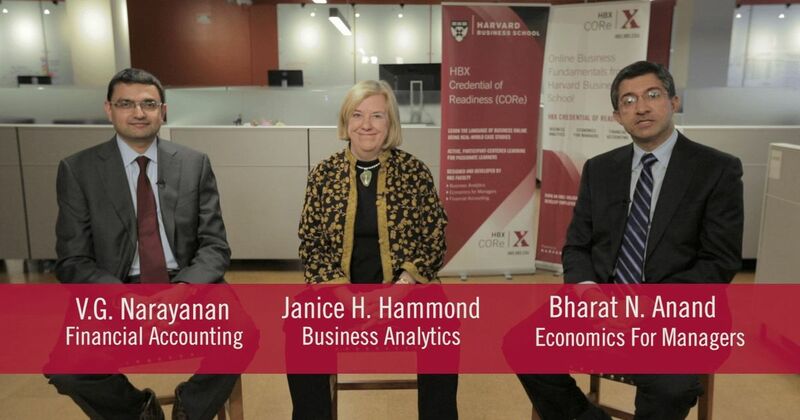 HBX currently offers a variety of programs such as CORe (Credential of Readiness), which consists of three courses – Business Analytics, Economics for Managers and Financial Accounting – Negotiation Mastery, Leading with Finance and Disruptive Strategy. 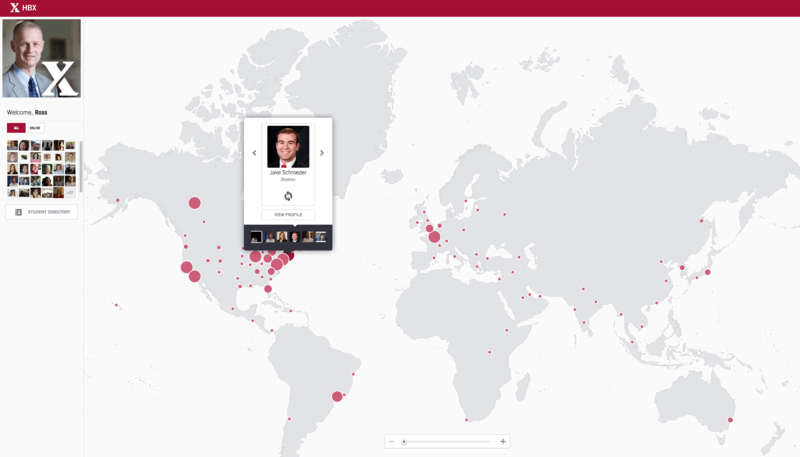 The HBX portfolio is growing, and new courses will be added in the coming months. Course durations range from 6 to 17 weeks. The courses are flexible, allowing participants to study on their own schedules while meeting regular weekly deadlines. The deadlines ensure that the cohort remains on roughly the same schedule, facilitating the social aspect of learning. 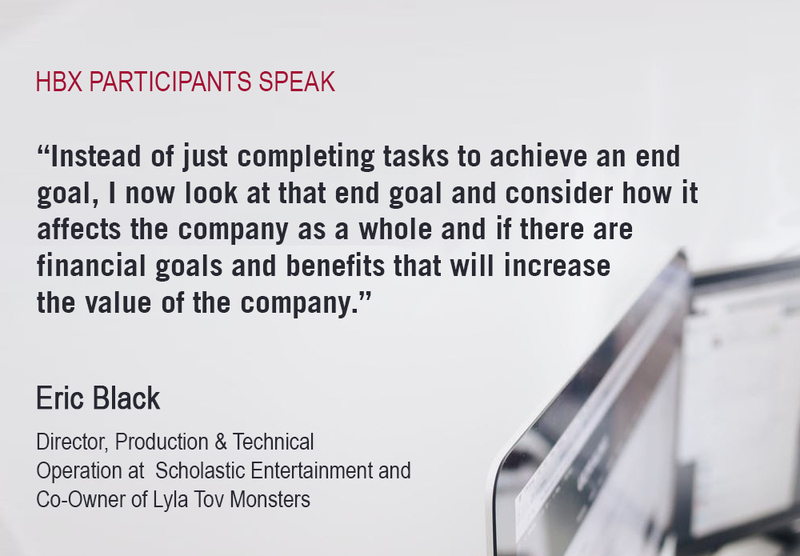 Upon successful completion of the courses, students will receive a Certificate from HBX and Harvard Business School. They will also be invited to the annual on-campus HBX ConneXt event to meet peers from around the world, hear from faculty, and experience the HBS campus. Interested candidates must submit a free, 10-15-minute application that is reviewed by the HBX admissions team by the deadlines noted on the HBX website. For more information and frequently asked questions, please review the HBX website.